There are twelve (12) pairs of Cranial Nerves that reside within the Cranial Cavity (i.e. 12 nerves on the right side and 12 on the left side.) Any of these nerves can be involved in and their function impaired by different disease processes such as occurs with Skull Base Tumors. 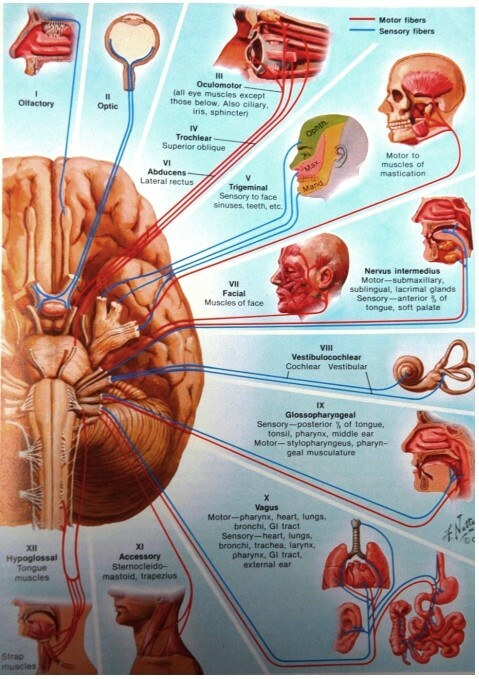 Figure 1: Diagram of the Cranial Nerves together with their functions. There is a category of Cranial Nerve disorders that is considerably different than any of the other diseases that affect these or other Cranial Nerves. TRIGEMINAL NEURALGIA (the 5th Cranial Nerve), HEMIFACIAL SPASM (the 7th Cranial Nerve) and GLOSSOPHARYNGEAL NEURALGIA (the 9th Cranial Nerve) are specific afflictions that share a common underlying pathological etiology (cause). The most common cause is a compression phenomenon exerted on the Cranial Nerve at its junction with the Brain Stem. This region is inside the Skull near its Base. The "compression" actually causes an injury to the normal insulating material surrounding the nerve, called MYELIN. This insulating material (which acts like rubber that insulates electrical wires) is injured in these Cranial Neuralgias as a result of compression that is exerted on the Cranial Nerve (usually by a tortuous artery and/or a vein, which has come to rest upon the nerve) at its junction with the Brain stem. The offending artery gains this peculiar position consequent to Atherosclerosis ("hardening of the arteries"). As the atherosclerosis progresses, arteries become slightly elongated and "firmer". This "lengthening" of the artery results in the artery actually moving to a "new" position. In these patients, it is their "bad luck" that the artery "falls" into this particular position relative to the Cranial Nerve Root junction with the Brain Stem. Once the Myelin is injured, any "stimulation" of the Cranial Nerve an result in a "short circuit" (and thus the symptoms specific to the particular Cranial Nerve's function) just as would happen in an electrical wire where its rubber insulation had been eroded. The same compression-distortion injury to the Nerve's Myelin has also been seen in patients with Cranial Neuralgias associated with an Aneurysm (a dilated portion of a blood vessel) or a tumor. While it is acknowledged that Aneurysms or tumors are very unusual as causes of these Neuralgias, it is imperative to obtain an MRI Scan (with Gadolinium contrast agent) in any of these patients early after the diagnosis has been made in order to identify these potentially lethal (Aneurysm or Tumor) conditions. The majority of these rare tumors are completely Benign Skull Base Tumors. Since these three conditions have a similar cause, their treatments are similar. The information that follows in this Section has been prepared to attempt to answer, in as specific manner as possible, the many questions that are frequently asked about them. The operative procedures used to treat these conditions are quite reliable but are ordinarily considered only for patients WHO HAVE FAILED TO RESPOND TO MEDICATIONS OR WHO HAVE HAD TO DISCONTINUE THE MEDICATIONS BECAUSE OF AN INABILITY TO TOLERATE THEM. Medical therapy is usually effective and can remain so for extended periods of time, particularly for patients with Trigeminal Neuralgia and Glossopharyngeal Neuralgia. Unfortunately, medical treatment for Hemifacial Spasm is not nearly as satisfactory or reliable.